​This dish tastes as though it has taken hours to prepare and cook, but it only took a few minutes to prepare these simple ingredients. If you have any tips or ideas to share I would love to hear from you, I can then add them to the post for others to see and try. Preheat oven to 425°. In a large bowl, combine potatoes, onion, oil, garlic, 3/4 teaspoon salt, 1/2 teaspoon rosemary and 1/2 teaspoon pepper; toss to coat. Transfer to a 15x10x1-in. baking pan coated with cooking spray. In a small bowl, mix paprika and the remaining salt, rosemary and pepper. Sprinkle chicken with paprika mixture; arrange over vegetables. Roast 35-40 minutes or until a thermometer inserted in chicken reads 170°-175° and vegetables are just tender. Remove chicken to a serving platter; keep warm. Top vegetables with spinach. Roast 8-10 minutes longer or until vegetables are tender and spinach is wilted. Stir vegetables to combine; serve with chicken. Nutritional Facts1 chicken thigh with 1 cup vegetables equals 357 calories, 14 g fat (3 g saturated fat), 87 mg cholesterol, 597 mg sodium, 28 g carbohydrate, 4 g fiber, 28 g protein.Diabetic Exchanges: 4 lean meat, 1-1/2 starch 1 vegetable 1 fat. If you love Blueberries and your Slow-Cooker then this is the recipe for you, it goes fabulously with ice-cream or even cold custard. You will be a hit with the Family- go on give it a try. Place blueberries, sugar, water and extract in a 3-qt. slow cooker; stir to combine. Cook, covered, on high 2-3 hours or until bubbly. For dumplings, in a small bowl, whisk flour, baking powder, sugar and salt. Cut in butter and shortening until crumbly. Add milk; stir just until a soft dough forms. Drop dough by tablespoonfuls on top of hot blueberry mixture. Cook, covered, 30 minutes longer or until a toothpick inserted in center of dumplings comes out clean. If desired, serve warm with ice cream. Learn how to make the best home-made soft pretzels right at home!! These are soft, salty, buttery and melt in your mouth. Absolute deliciousness! If you've never made homemade pretzels before, give them a try. They are so easy to make, there's no reason not to! 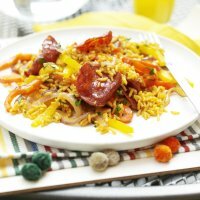 ​You can't go wrong with this dish and it is every ones favourite, whether served up with spaghetti, jacket potato, french fries or even stuffed in a pepper. There really isn't anything to 'NOT' like about it. This time it has a little something added to it which gives a whole new meaning to 'spaghetti bolognese', that's right green olives. Heat the oil in a large heavy-based pan over a low to medium heat and cook the onion for 5 minutes until softened. Turn the heat up and add the minced beef. Continue to cook until browned, then add the crushed garlic. Cook this out for a couple of minutes but do not allow the garlic to brown. Add the pepper and mushrooms and cook for a further 5 minutes or until they begin to soften. Add the olives, tinned tomatoes, 300ml of the beef stock, tomato purée and dried oregano and bring to a simmer. Allow to simmer for 40 minutes, topping up with more stock if it starts to dry out, until the sauce has thickened. Season with black pepper. Cook the pasta to the packet instructions and serve with the bolognese. Sprinkle with grated parmesan to serve. Most of the ingredients you will I am sure already have them in your cupboard or freezer so lets get started. 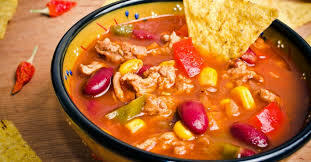 For working Mums and Dads get your slow cooker warming then start preparing your soup. Brown of the ground beef in a heavy based pan,***. Drain off any excess fat, follow the steps above place into your slow cooker, give a stir and turn your slow cooker to low. This will be ready and waiting for you when you get home from work, or just a day out with the family. ***** I tend to use my old faithful wok for this sort of prep; it is so convenient and I can get a lot of ingredients into it without splashing out every where. This is definitely the ideal dish for a cold day, it can be made on the stove top or in a slow cooker depends on your time slot. But either way it is simply delicious, my kids love it with tacos but me just plain crusty bread 'oh' and some butter. I know it's cheating using a packet of 'Uncle Ben's' ready cooked rice but with busy lifestyles now we deserve a little cheating. The chorizo and red chilli goes perfect with sweet peppers and ready in 15 minutes, ideal for everyone. Heat oil in pan and sauté onion and chilli for 2-3 minutes, then add red and yellow peppers. Cook for another 5-6 minutes stirring occasionally. While this is doing heat the rice according to packet instructions. Add chorizo to the pepper mixture and stir fry for 3-4 minutes, then add your rice and parsley. The beauty of this pie it can be made in advance and then frozen, and once thawed out you would never have known it was in the freezer. It's perfect for when you have company. Beat the cream cheese and cappuccino spread together with electric mixer. Add powdered sugar and milk. Blend well. This soup delivers a big bowl of summery comfort. Toppings like avocado, sour cream and tortilla strips are a must. For the Soup: In a medium nonstick skillet, heat the oil over medium heat. Add the onion and garlic, then cook until soft, about 3 minutes. Scoop into the slow cook along with the rest of the soup ingredients. Cover and cook on low for 4 to 6 hours. Remove the chicken and shred with 2 forks. Then return the chicken to the slow cooker. For the Toppings: To serve, ladle the soup into 6 bowls, then divide the toppings evenly among them. How many times do we say "I don't know what to do for dinner" well this really easy quick recipe can be done in no time,and the kids will love it too. 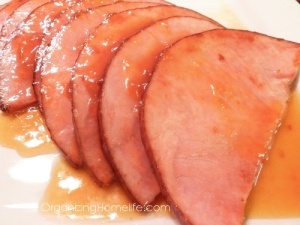 In a skillet, saute ham slices in 1 Tablespoon of butter until lightly browned, turning once. In a saucepan, combine the preserves, vinegar, ginger, salt and remaining butter; heat through. Serve ham with the apricot sauce, creamy potatoes and garden peas.Enjoy! Tip: don't over do the ham as it can become tough. 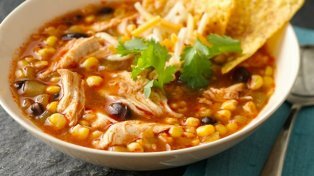 If you like using your slow cooker as much as I do then this recipe is just the ticket, whether it's sweet or slightly spiced it's your choice. Using a sharp knife, cut through the joint of each leg quarter to separate into two pieces. 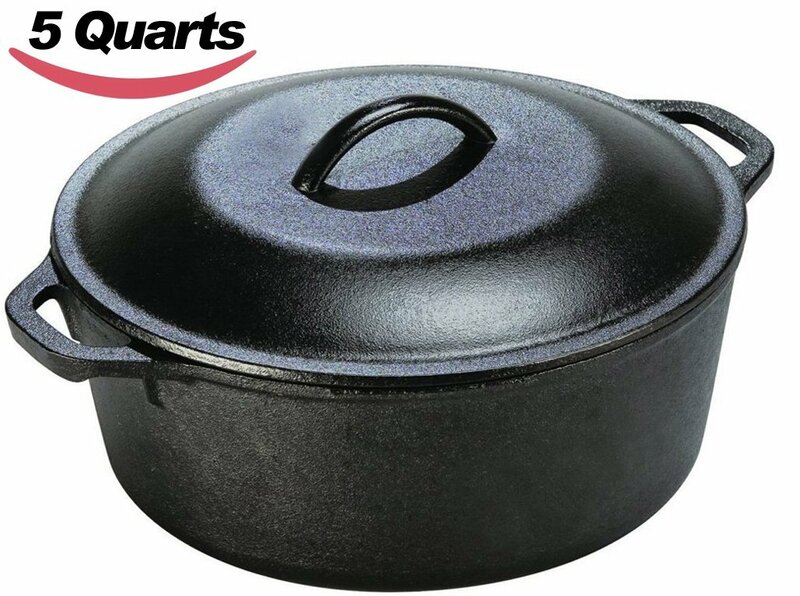 Place chicken in a 4-qt. slow cooker. In a small bowl, mix ketchup, orange juice, brown sugar, vinegar, oil, parsley, Worcestershire sauce, garlic salt and pepper; pour over chicken. Cook, covered, on low 5-6 hours or until meat is tender. Remove chicken to a serving platter; keep warm. Skim fat from cooking juices; pour into a measuring cup to measure 2 cups. Transfer to a small saucepan; bring to a boil. In a small bowl, mix cornstarch and water until smooth; stir into cooking juices. Return to a boil, stirring constantly; cook and stir 1-2 minutes or until thickened. Serve with chicken. Yield: 12 servings. Nutritional Facts1 serving equals 179 calories, 9 g fat (2 g saturated fat), 45 mg cholesterol, 392 mg sodium, 12 g carbohydrate, trace fiber, 13 g protein. Diabetic Exchanges: 2 lean meat, 1 starch, 1 fat. Hi Gloshei here I just want to welcome you to my blogs, please remember any questions I am always here to help you. Either leave a comment or go to 'contact' and send me an email.